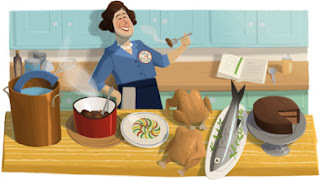 Yesterday it was the anniversary of the birthday of Julia Child. Even google celebrated with one of their already classic doodles. Some of you would have known about her after watching the movie Julie & Julia, where the character of Julia was performed magistrally as always by Meryl Streep . Both of them were/are quite tall, over 6 feet in the case of Child. But, who was Mrs. Child? Destiny took this Pasadena girl to live in Paris in 1948 because of the WWII. Her husband was reassigned to work in the Information Service at the American Embassy in Paris. Therefore, Child became a Parisian in her way of cooking. She attended classes in the well-known school Cordon Bleu and afterwards, she even dared to found her own one with two classmates and they called it L'école de les Trois Gourmandes. With the goal of adapting French sophistication in cuisine to the American public by publishing a two-volume cookery book Mastering the Art of French Cooking, which was rather innovative. Thanks to the good selling of the book, she embarked in a new adventure: television. Her first programme was a The French Chef, changing American ideas on cuisine. From that moment on there were more TV shows and book publishing, being the latest Julia’s Casual Dinners published in 1999. She was also criticized among other things for using too much fat and not washing her hands in the kitchen. 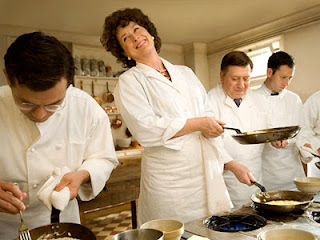 Despite critics, Julia Child was the first woman in the Culinary Institute Hall of Fame. Q me acuerdo de Julia!! Q grande eres, siempre apunto!!!! y como eres mi profe favorito, una nominación para q nos cuentes más cositas de ti!! !